St. Georges Day, April 23 is a historic date in the English calendar. So it was with great pride that John Wraith, co-owner of the Stags Head Bar in soi LK Metro, put together a full day’s fun and entertainment. The day started with around 40 children from the Pattaya Orphanage visiting the English style bar, appropriately decked out with red and white balloons. All had great fun, and all were well fed. As the band plays on, Englishmen and friends celebrate St. Georges Day at the Stags Head Bar. 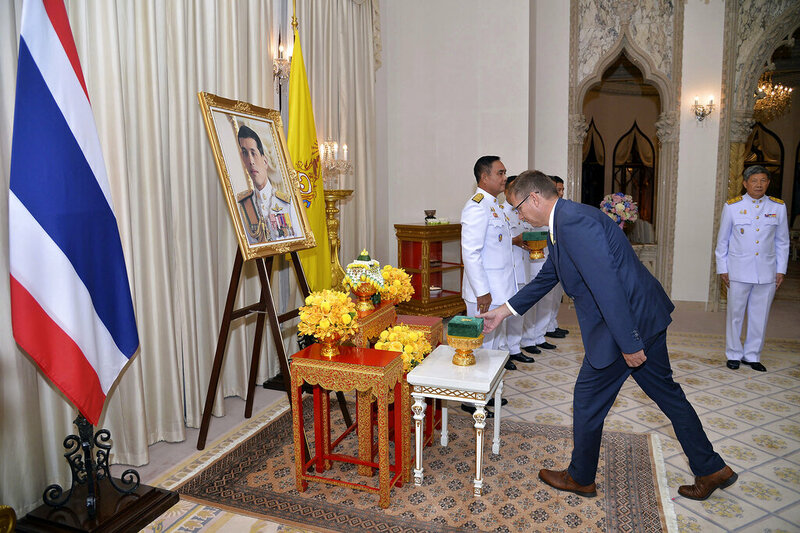 Soon after the happy children were sent home, a double-decker bus arrived with the Royal Thai Air Force Brass Band. 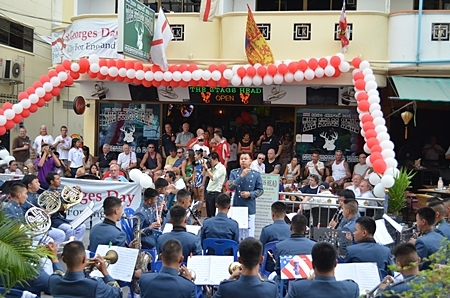 A cheering crowd was soon entertained with songs like Moon River by the 40 piece band, conducted by Flight Sergeant 1st Class Surasak Permkasem. Luckily there were no Christians needing protection from the Romans, or dragons for the patron saint to kill, but two pigs gave up their lives for the buffet to feed the St George’s Day revelers!